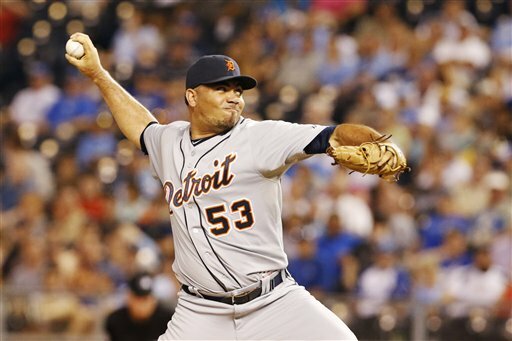 With Jose Valverde back in meltdown mode, the Tigers very well could turn to Joaquin Benoit as closer. But that would likely only provide a short-term solution and cause long-tern problems. Benoit is one of the best setup relievers in baseball, ranking in the top eight in Major League Baseball in holds each of the last three seasons. It's not like he hasn't been tried as a closer before. He has - actually quite often. The results have been disastrous. In his career, Benoit has converted just 16-of-40 save opportunities. He's 3-for-3 this year, but his track record suggests it is just a matter of time until that changes. He's 35 years old. It's unlikely his career course is going to turn at this point, nor should it. The problem is two-fold here, if Benoit were to become a full-time closer. One, it is very much an "if" whether he can get it done in the closer role. Two, it would be blowing one tire, the setup spot, to fill the closer role. The setup role is nearly as important as the closer's role. Even though the Tigers' starting staff has been the best in the American League this season, Detroit starters are averaging just 6 1-3 innings per start. It would be unfair to expect Benoit to be the Tigers' closer, and perhaps costly to the team overall considering how it could throw the balance of the pitching staff out of whack. It's why the only apparent solution, ultimately, is a trade. The 16-of-40 stat is grossly misleading, as Benoit has spent nearly all of his career in setup roles where, if he prevented the tying or go-ahead runs from scoring, the closer would pitch the 9th, and if he didn't then it would appear as a blown save on the stat sheet. The whole closer notion is utterly ridiculous. Any strong relief pitcher can pitch the end of a baseball game, and no lousy relief pitcher will survive the 9th (or any other inning) for very long. Benoit would do just fine closing games out - he'd be exactly as effective as he has been in the eighth; no better and no worse. A good point here, however, is that if Benoit goes to the 9th, everybody moves up a spot. That's fine; there are enough good arms on the roster, in the organization, or available for not terribly much that the problem is easily enough solved. Sure, the Tigers can go out and spend $10M a season on a PROVEN CLOSER, or they can pay a tenth of that and find someone 90 percent as good but without the save resume. I agree somewhat Pat, I hope the Tigers don't overuse JV. I think JV can do the job but not day in day out. If a starter throw 8 innings and Benoit hasn't pitch in a while and JV pitch the night before, then I would use Benoit. I really like the Fish closer, even though he not available or stats to back him up, to trade for. The "Man In The Box" trade grooves too many for me. Pat, there is no way that Benoit has only successfully closed 16 out of 40 chances. You're misunderstanding the stats. Yes, he has 16 career saves and 24 career blown saves, but a pitcher gets a blown save even if he blows the lead in the 6th inning. A non-closer can ONLY get blown saves and never saves. They get holds instead. I don't know what his percentage of success is when acting as the closer, but it's much much higher than you think. And Benoit is 10x the pitcher that Valverde is at this stage of his career. Either he or Smyly would be fine as a temporary option. The problem is we need more than 2 reliable bullpen arms. I think if you can pitch the 8th, you can pitch the 9th. I think we get hung up on "proven closers". If an innovative manager ever breaks the "closer only in the 9th inning" mold years from now for something more efficient, we will all look back and shake our heads. A trade is the best option, this bullpen needs help. It has no depth. Benoit and Smyly are the only sure things as of now, don't mess with them. Contrary Guy is exacting right. If you study Sabermetrics, he is right on. New 3rd base coach, Brookens made two stupid calls on sending in runners who were out. Dumb. On first one, we get hit the next batter. If you study the stats, a chance like that doesn't make sense. It looks like Leyland is trying to play more "small ball", wrong.